Our Abpromise guarantee covers the use of ab27494 in the following tested applications. May function as Rho-guanine nucleotide exchange factor. Detected in cAMP-treated chondrocytes, but not in untreated chondrocytes. Detected in fetal brain, heart and spleen, and in adult testis, kidney and lung. 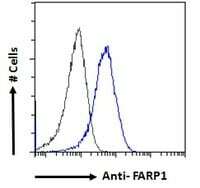 Immunofluorescence analysis of paraformaldehyde fixed U2OS cells, permeabilized with 0.15% Triton. 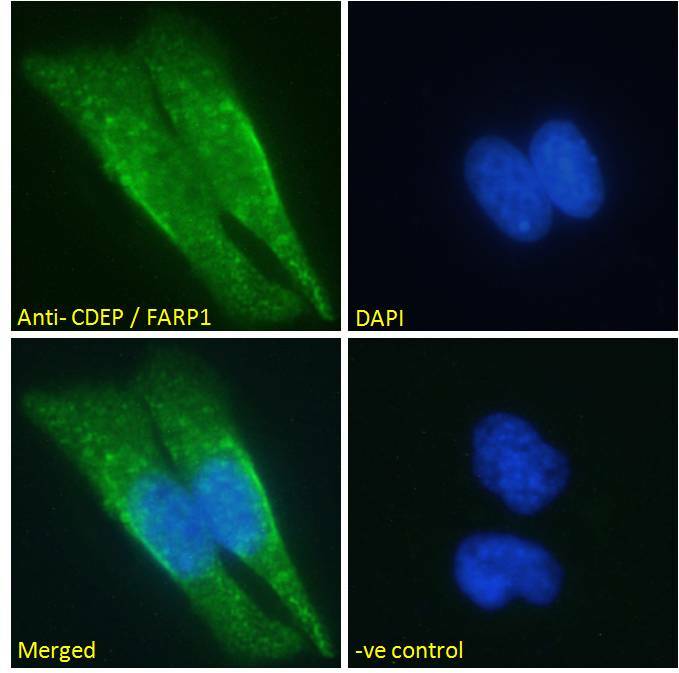 Primary incubation with ab27494 1hr (10 μg/ml) followed by Alexa Fluor 488 secondary antibody (2 μg/ml), showing cytoplasmic staining. The nuclear stain is DAPI (blue). Negative control: Unimmunized goat IgG (10 μg/ml) followed by Alexa Fluor 488 secondary antibody (2 μg/ml). Flow cytometric analysis of paraformaldehyde fixed HepG2 cells (blue line), permeabilized with 0.5% Triton. Primary incubation with ab27494 for 1hr (10 μg/ml) followed by Alexa Fluor 488 secondary antibody (1 μg/ml). IgG control: Unimmunized goat IgG (black line) followed by Alexa Fluor 488 secondary antibody. Immunofluorescence analysis of paraformaldehyde fixed HeLa cells, permeabilized with 0.15% Triton. 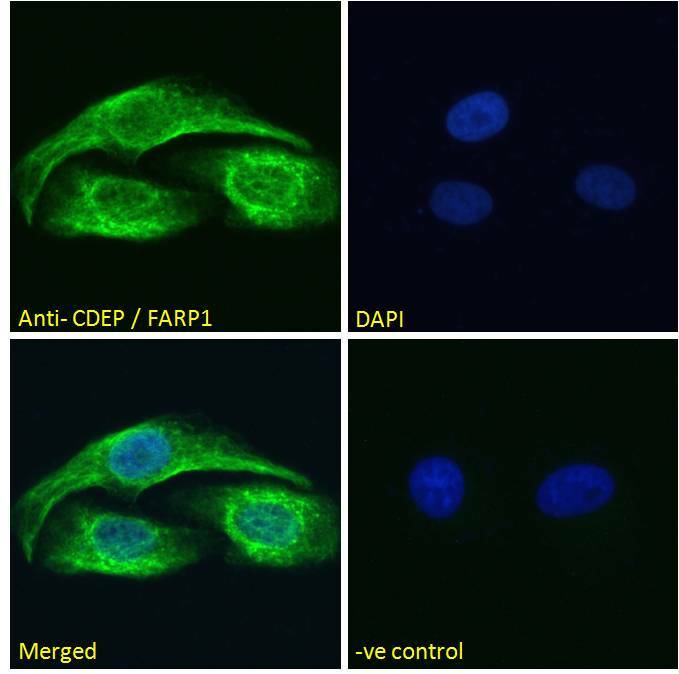 Primary incubation with ab27494 1hr (10 μg/ml) followed by Alexa Fluor 488 secondary antibody (2 μg/ml), showing cytoplasmic staining. The nuclear stain is DAPI (blue). Negative control: Unimmunized goat IgG (10 μg/ml) followed by Alexa Fluor 488 secondary antibody (2 μg/ml). ab27494 has not yet been referenced specifically in any publications. Publishing research using ab27494? Please let us know so that we can cite the reference in this datasheet. There are currently no Customer reviews or Questions for ab27494.